I had to write about Baker Marine, a boat repair and storage shop located in Muskegon, MI and run by owner, Steve Baker. My neighbor has a boat and the trim had died on it. He told me he was going to call his mechanic and have him take a look. That same day, I saw Steve Baker stopped by and fixed the problem. It was simply a fuse and Steve didn’t charge for the repair. Being the good neighbor he is, Steve was forced to take something for his time; that convinced me to make note of Baker Marine should I ever need anything. Sure enough, a couple weeks later, I needed that information. I have a Pontoon. While out with friends, I ran across something that destroyed the lower unit (that is putting it mildly). 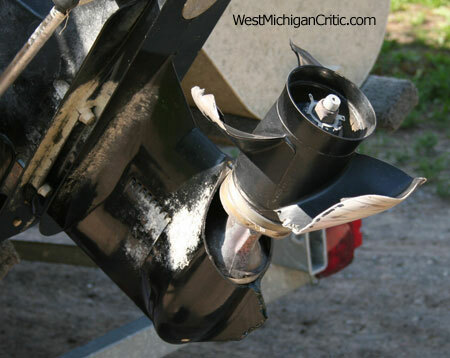 The insurance adjuster (and if you don’t have boat insurance, I highly recommend it!) and Steve Baker both said that it was one of the worst cases they have seen. To make a long story short, Baker Marine had a re-manufactured lower unit from Jasper Engines and Transmissions installed and the boat was back in the water in a week! We formed a mutual admiration society – I loved the service, the boat insurance adjuster actually thanked me for bringing Baker Marine to his attention (he was impress with the labor rates) and Baker Marine stated that the insurance adjuster (out of Grand Haven) was a great person to deal with (most insurance adjusters are not) – everyone was happy! I also called around for boat storage, which included Torresen Marine, The Mart Dock and Pointe Marine and was shocked at the cost of storage. Heated boat storage was insanely priced (perhaps I need to open a boat storage facility!) and cold boat storage was right behind! Over $1,000 for cold boat storage! I called JC Pontoon, manufacturer for my Tritoon and asked them about cold storage. The said that they store their pontoons outside and that it won’t hurt the boat as long as you have it shrink-wrapped and well ventilated – ventilation being the key. Halls Sport Center in Muskegon also said they store boats outside and suggested using moisture packets to keep things dry (Halls Sport Center was also pricey for boat storage in Muskegon). I saved over $1000 going with Baker Marine and boat repair by putting my boat in cold storage at their storage yard. If you are considering storing your boat in Muskegon, Grand Haven or the Whitehall area, I highly recommend you contact Baker Marine and compare. Steve gave me the impression that he is a mechanic you can trust, and those are hard to find. The insurance adjuster was happy, I personally watched him provide above and beyond service to my neighbor, and I was lucky enough to have him work on my boat. Shortly after I received my boat with the refurbished unit (Steve said that ‘refurbished’ is how it’s done and that the units are as good as new), I was out in the big lake and stopped to take pictures of the log below. 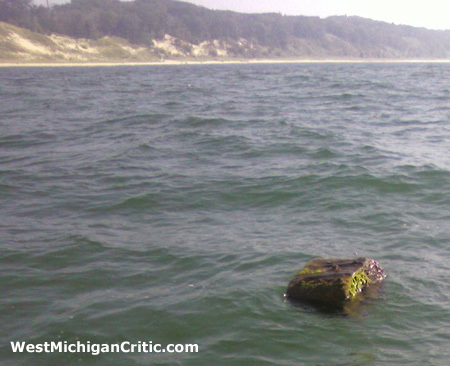 This log was right in the boat path from Grand Haven to Muskegon and I was thrilled that I missed it! 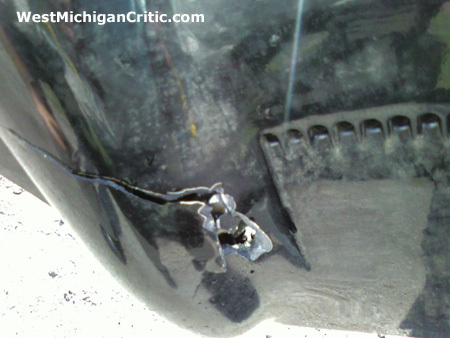 Muskegon Boat Repair needed once again and turns out that I was very unlucky. From what Baker Marine stated, this hardly ever happens and as you can see, the gears blew right out of the unit! Steve said not to worry and that he would send it in and make sure I was taken care, no charge. He did send in the unit, installed the new one and let me know that because the end of the season was near, the warranty would not start until next spring. I never had a chance to take out the second unit, but I anxiously look forward to spring. The only bad part about all this is you have to drive half throttle on new units for about 20 hours! I’ll post back in the spring and let you know how repair expert Steve Baker did on getting me up and running! Update: It works like a charm – the 20 hours was a killer, but I’m back on the water again and everything works great! Steve is the best. He had to troubleshoot my new engine for 3 years as to why there was water in the crankcase. Long story short he visited multiple times. Finally engine blew. A crack somewhere. He replaced engine with a refurbished block etc. Runs like a top. He winterizes and stores every fall. Great service from a true boat expert. Hello, want to share that baker marine is an outstanding company to use if you have boat service needed .. I’ve been fishing in west much for over 20 yrs.. I’ve had 3 boats from 22 ft with 150 merc to 17 with 60 4 stroke .. I’ve fished pro tourneys and as guide on many lakes incl. musk .. Sag river , Detroit river .. A recent electrcal issue with Nav lights turned into tilt trim issue and faulty new parts I had recieved..Steve baker and his crew got me in despite being swamped with many boats to repair .. Fixed all problems the 2nd day including a gauge that had bad wiring .. He didn’t give up , kept me informed and corrected all problems and for a very reasonable cost.. Absolutely the bbest move I’ve made in selecting new marine technician since moving to fruitport a year ago.. THE BEST PLACE FOR BOATS !!!!!!!!!!!!!!!!!!!!!!!!!!!!!!!!!!!!!!!! I’m a pastor at Bluffton Church and have been using Steve Baker for my marine repairs in Muskegon a few years now and have always been completely happy in every respect. I’ve had Steve service, pull, shrink wrap and store my boat for a few years. Always dependable, and his prices are always fair. I would recommend him to anyone. It’s been a few years since I’ve done the review. I ended up with a new problem (as one always does with boats) that chewed up A LOT of Steve’s time. The engine was acting like it was starved for gas from time to time. Some days it ran great, others it just acted up – it still ran, but very annoying. Steve came out to the boat many times with a ton of equipment and in the end, concluded that it was the control module. He tried replacing the control module with a spare to see if that was the cause but it didn’t work out – the whole point of the test was to make sure this was in fact the problem – that test didn’t work out. Long story kind of short – Steve was completely honest about not being sure if it was the control module and that replacing it was very expensive. At the time Steve didn’t have the equipment to test to control unit and recommended another boat repair shop that did have the equipment. I took Steve’s advice and brought the boat to the new repair shop and they found the problem (so they thought), it was the rotor which had too much play in it. I explained the findings to Steve and Steve expressed his doubts. Sure enough, it ran fine for a day and the problem was back! I brought the boat back to the same place and one of the mechanics, while testing it on the water, noticed it wouldn’t go into gear as easy as it should and remembered long ago that he once had a similar problem with a switch (the switch kills the engine or something when going from Forward to Reverse) and decided to test it. Sure enough, that was the problem ($25 part). The mechanic said that it was pure luck he found this and that it’s a very rare and tricky problem! Steve was completely honest with me and these days, that goes a LONG way in my book! As I mentioned before, I’ll bring my boat back to Steve should I ever have any new problems. Jim, I wish your reviews had dates. The only way to guess when you posted something from the review page is to look at the dates on the comments. By the way I got here because someone recommended Baker to me and I googled to see what I could find. Thanks. It sounds like Baker is a good guy. As far as the “expensive” storage yards you mentioned. These yards are all based on the water in order to have travel lift access. The buildings and the property taxes are very high. If your boat is on a trailer you can surely get much cheaper storage by towing your boat upland to a facility with a lower overhead.